Our farm store is located in a 19th century dairy barn. Over the years it has housed chickens, beef cows, pigs, sheep, goats, horses, and ponies. 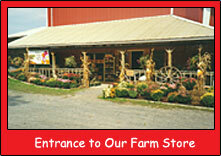 In 1975, we decided that we needed a place to sell our produce and converted the barn to a store. 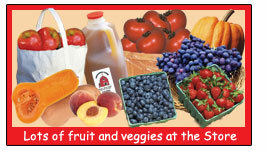 The store features country "themed" products as well as our own fresh produce. It is also a place to display our collection of antiques and farm tools, which is hung from the rafters and walls of the old barn. Many items in the collection were used right here on the farm and generous friends and neighbors gave the others to the farm. Products for sale include locally made honey, maple syrup and preserves. We have locally milled flour, pancake, cookie, bread, and muffin mixes as well as popcorn kernels in gallon jugs. The store carries Hershey's old fashioned ice cream novelties including Popsicles, Nutty Buddies and Fudgesicles, and we also offer a nice selection of cold beverages and snacks. For those of you who like to work in your own kitchen, we have a huge selection of items: gadgets like cherry pitters and apple peelers, food mills, cookie cutters, pie plates, cookbooks, and pottery. During the season our store is 'canning central'....chock full of canning and jam and jelly-making supplies. We also carry a large selection of tasty food items including ready- made jams, jellies, fruit syrups, relishes and pickles, and delicious 1000 Island River Rat cheeses. We have antiques, lamps, candles, scarves, jewelry, and many other unique gifts to choose from. And don't forget....we always have our own fresh, ready-picked fruit at the Farm Store if you don't have time to pick yourself - and lots of homegrown and local veggies, too! Stop in and visit the Store - something for everyone!